Candyfloss & Persie: Happy Birthday Jocelyn! So I had an amazing, amazing birthday and thank you everyone who left me kind notes! My birthday is August 8th and my Sister's is August 9th though we're 2 years apart. Despite a few fights about the party and the cake when we were little, it's really special to share a birthday right next to hers. Jocie is my best friend and the person I call the most when I need help with a situation- she's my backbone and my ever present ear and I don't know what I would do without her. We're so different in so many ways but then entirely the same in many others. Happy Birthday Jocie! I love you!!! ...awwww , I'm glad you had an amazing Birthday , I believe you are tired now : ) ..and that is unbelievable that you and your sister have day appart with 2 years ..wow..
..looking forward to pictures .. Happy Birthday! Hope you had a good day :) My sister and I are (3 years and) 9 days apart! Happy Birthday. I do hope all your birthday wishes come true. Have a fantastic week. The Mrs. and our older son were born one day apart. Wish you a very happy birthday to your sister...and that picture is so adorable ..I loved it ...take care....CHEERS!! That last picture is too sweet! Happy birthday to your sister! Holy hell that last picture is to DIE for!! Too cute! Sounds like you had a wonderful birthday! Happy birthday to your sis too!! Awwwww - Caitie - you just made me tear up!!! Thank you for the well wishes. I feel very luck to have a sister like you and I love you more than you know!!! 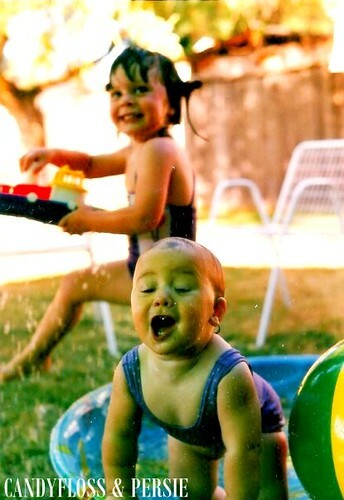 What an adorable shot of you and your sis back in the day, aww!! :) HAPPY BDAY TO YOUR SIS!! P.S. I guess I never wished you to have a happy bday? Happy belated birthday then, Caitlin! It's kind of funny how we're having another coinsidence here - my father's bday is August 8th and I've been in the countryside with them again that past weekend to celebrate! Aww yay for you guys! Sisters are the best. These pictures are beyond adorable. That's awesome you almost share a birthday with your sis. And even more fabulous that you two are so close! Can't wait to hear about your birthday, and happy belated!!! Such cute pics of the two of you! I am alot closer to my sister now we are grown up! I love this! My sister is one of my best friends. Having a sister is truly one of life's greatest gifts if you ask me! Hope you both had wonderful birthdays! !